Hi everyone. Here is my design team card for the latest challenge at Addicted to Stamps & More #46 - Anything Goes. I made a CAS baby card using my new Gingham wheel stamp from SU! ... coral ink onto blushing bride cardstock (LOVE this color combo!). Hope you like. I used my Stamp-a-ma-jig for placement of my "welcome" (stamped in Coral ink) and then popped up the "baby" letters for added dimension. Labels: baby, CAS, my favorite things, Stampin' Up! Well I'm with Kylie! Couldn't believe you'd used a wheel stamp.....must check that out. Great CAS card and love the colourway. Cute baby card, I love the colors! One could never tell the gingham pattern is hand made -looks so professional and like store bought patterned paper! Loll it really looks liked you've used patterned gingham paper, such a lovely CAS card. This is adorable, Loll! That gingham stamp wheel looks amazing, great job. 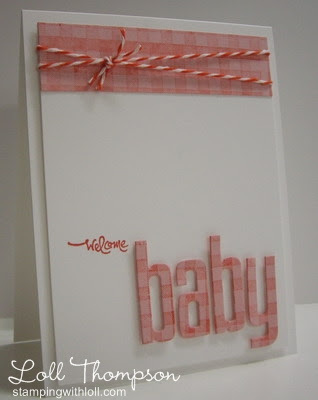 Lolly, what a fun new-idea baby card you've created!! I love it! Hi Loll. Lovely card. Really enjoyed reading how you made this. Great way to make your own gingham. Absolutely gorgeous hun and thank you for popping by mine and leaving such a sweet comment on my challenge card recently...means a lot!! I love the color of this Loll. What a terrific idea to use the wheel to create that custom lettering. Absolutely darling!! I'll have to remember the coral on the Blushing Bride! So pretty and a wonderful baby card! Sorry to be late to the party Loll! My home computer is at the shop being fixed and it takes forever. I had to laugh when i read that you used a Stampamajig.....because I was feeling envois when I looked at your perfectly placed sentiments! (Happy Bee-day)......and I love this card. Clean and simple and smart to use the plaid like that!